Yes, I'm one of those slightly obnoxious parents that gloats that my child doesn't watch any cartoons. In reality, Noah just didn't show any interest in any form of children's cartoon character, the only channel he would pay any interest too was Baby TV, which I was more than happy with as most of the bits on there are educational. He's always been more of a music baby (curse you uptown funk) and will stop, dance and giggle away at all the latest hits, Sam Smith, Bruno Mars, Meghan Trainor - you name it, he'll stop and dance to it. But he's just never shown any liking to your usual childrens programmes. So can you imagine my horror when he suddenly starts voicing 'Peppa' 'Peppa' at me? Where on earth did that come from!? Daddy, that's who. In the weekday mornings, as I start work earlier than John & take a little longer to get ready, he often feeds Noah his breakfast, and unknowingly to me has got him very much interested in Peppa Pig. Something I will freely admit I tried to almost enforce onto Noah, so that I could use the programmes to keep him still on our previous holiday - it failed. Now, Daddy seems to have managed to get him hooked. Okay, okay, I might be exaggerating, but he can fully recognise her face and point her out as 'PEPPA', at which my looks could possibly kill John. I'm not entirely sure how I feel about the whole thing, it's not really a bad thing I just still feel he is very young. I as a child watched Tots Tv, Pingu and all the other silly cartoons and didn't end up with square eyes. 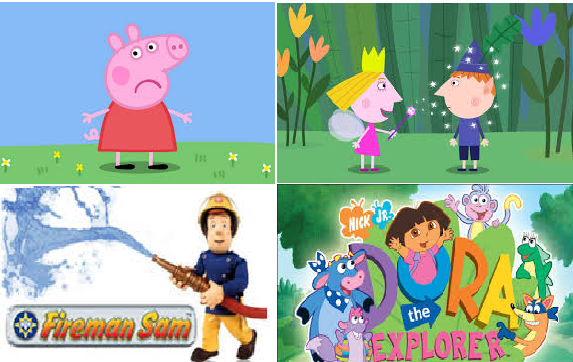 How do you feel about childrens cartoons?